These are condensed notes from the message that I preached today at Celebration. I also expect this to go on our podcast sometime this week for anyone who has interest and might want to listen. How long has it been since you’ve been still? I mean absolutely still and listening for God to speak to you? I love stillness but have to be intentional about it. I have a hate/hate relationship with my phone. Lately as I’ve been researching for a book I’m writing I have been reading a book entitled Mad Church Disease by Anne Jackson. In it, Jackson writes about her journey of pastoral ministry and the burnout and breakdown she went through. She realized she was melting down after returning text messages in the shower. She felt so pressured and so many expectations to respond to people immediately that she actually had her phone in the shower and was texting. 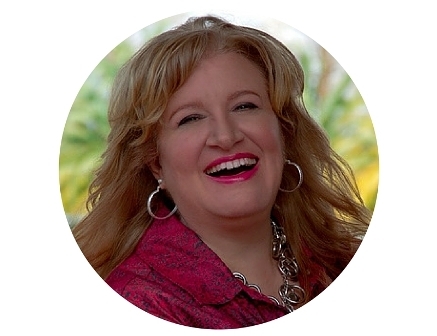 She ended up needing therapy to get back on the road to health. Before we think this is so crazy, let's consider our own habits. I know when the WIFI is temporarily shut off on our CC campus during any given service, we have people go bonkers about it and run to the media booth asking what's wrong. God forbid we not be connected for a few moments. On December 29, 2011 the New York Times published this article entitled The Joys of Quiet. My friend Sue Duffield passed it along to me and I was really affected by it. This article speaks of the overwhelming noise in our world today and the great lengths people are going to get away from it and unplug. Is it wrong to be connected? Certainly not. There’s a place for it – not to mention it's a missionfield. In fact, last week I was privileged to have a part in leading two more friends to the Lord through Facebook. Technology is a wonderful thing, but we’re meant to rule it, not have it rule us. We have to learn stillness. There is a balance. 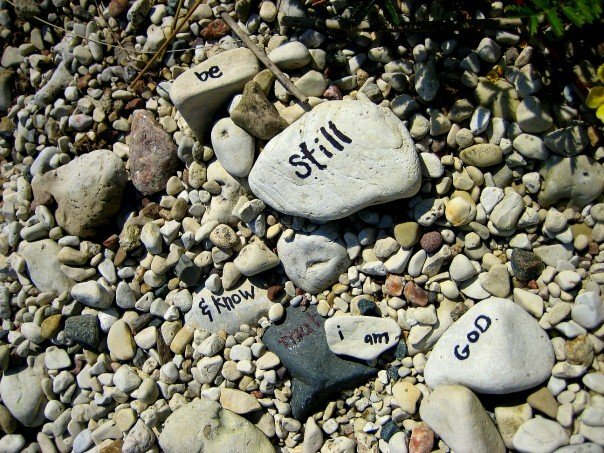 Psalm 46:10-11 says, "Be still and know that I am God; I will be exalted among the nations. I will be exalted in the earth. The Lord Almighty is with us; the God of Jacob is our fortress." We want God to be exalted in our lives. We want to feel He is “with us.” We want to feel that we are not alone, that He is protecting us, that we have a refuge, a fortress. Many people feel God is not with them. Even on social media people cry out, “where is God in my life right now? Why is this happening?” I see these kinds of statuses every week from people who feel abandoned and alone. I had a thought, maybe they’re not with God. That’s why they don’t feel God. God always wants to be with us. But do we want to be with Him? If you feel like God’s not with you maybe you need to ask if you’re with Him! The Word of God tells us to draw near to God and He will draw near to us. This doesn’t mean we need to throw away our computer or TV’s or go to extremes. Ever been to a wacked out church where they tell you to get rid of your TV’s and shut off from the world completely? Yeah, that’s called a cult. Ecclesiastes 7:18 says, "It is good to grasp the one and not let go of the other. The man who fears God will avoid all extremes." God isn’t asking you to throw away your TV or your computer or your phone. But He is asking you to take time to get still before Him in quiet time, and to honor Him when His word is going forth corporately. If we want God to share amazing things with us and do amazing things we have to set the atmosphere. Abraham rushed out to meet the Lord and the angels, washed their feet and made them something to eat. Abraham was faithful to God and honored and created the environment for God to speak countless times – set an atmosphere and so the Lord came and started telling Him things. Now there’s an environment for communication. When I tell my husband something unimportant I might shout it from the other room. "Hey, do we have any paper towels in the cabinet?" This doesn't require looking into each other's eyes. When I am discussing something important about our relationship, our children, our church life, we have to be connected -- not running by or shouting from the other room. There is a lack of honor today for the presence of God. If you do not believe that watch all the people that talk to one another during a message or walk in and out like they are at Target or Walmart during worship. There are dimensions of spiritual things that will never be revealed to the apathetic worshipper. If we want something different in God we have to honor His presence, take time to stop, be still, seek His face and follow His leading into new levels of His presence. There are “secret things of God” and He longs to share them!! The amazing thing is that He doesn’t want to keep His secrets hidden. Any of us can discover them, if we’re willing to take the time and be still. It’s not His heart to keep them hidden but He’s not going to share them with people who don’t honor His presence. Some people think they are going to miss something if they abandon all else for getting still in God's presence. Not true. We get our best ideas, our best solutions, the answer to all we need in His presence. Isaiah 40:31 "But they that wait upon the Lord shall renew their strength; they shall mount up with wings as eagles; they shall run and not be weary, they shall walk and not faint. This was a powerful word he received, perhaps the most powerful thing ever communicated to him, but here is a major key, he had to turn to see it and then hear it. Exodus 3:3 "And Moses said, I will now turn aside, and see this great sight, why the bush is not burnt." If we want to see and hear great things we have to STOP AND TURN ASIDE!!! Will you set the atmosphere like Abraham? Will you take time to set the environment so you can hear the secrets He will share? Will you turn aside like Moses? Will you turn aside and stop to hear the word that God wants to speak to you? 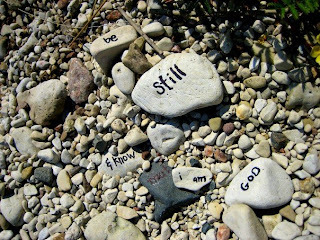 Will you take time to BE STILL AND KNOW that He is God in your life? If you're feeling like God's not with you or He has abandoned you rest assured, He's with you -- but ARE YOU WITH HIM?